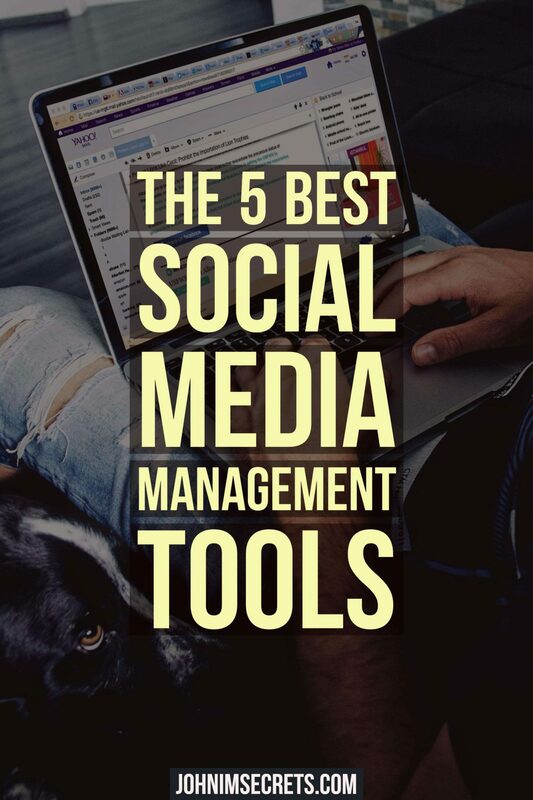 There are so many social media management tools out there and there is no way I could possibly try them all, however, I've tried many and just a few have been able to truly meet my needs. What Social Media Management Tools Have You Used? Hint: You can achieve this kind of results in about three months (or less). 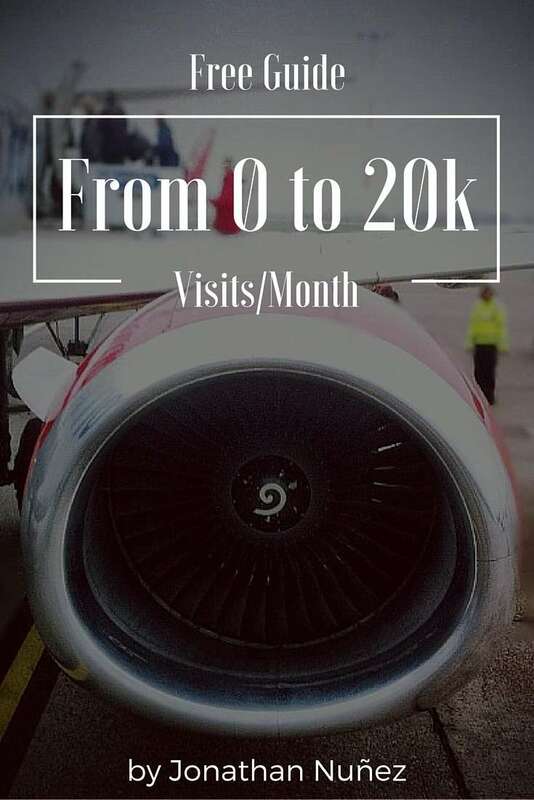 This FREE step-by-step guide will show you how to go from 0 to 20,000 monthly visitors every month, it includes the strategies I use to grow my website every month. If you are already receiving 20,000 monthly visits, it will help you double your traffic. LET ME ACCESS THE FREE GUIDE! Hootsuite is the most popular social media management tool for both people and businesses, this particular dashboard allows you to manage up to 3 profiles with the free version and up to 100 with the PRO version. Facebook: Profiles, pages and groups. Google+: Only your Google plus business page. LinkedIn​: Profiles, groups and companies. WordPress: Yes, you can link your WordPress blog with Hootsuite as well, this makes it easier to share your blog posts. Pinterest​: You need the Tailwind app. YouTube: You have two apps to choose from, one is free and another paid, this one offers many more features that the free one won't provide like, statistics, scheduling the upload of your videos, etc. Evernote: You can add a tab for the evrnote app and add as many notes as you want, manage them in the cloud, etc. There are many more, 155 to be exact. You can search their directory and I'm sure you'll find some that you'll enjoy. 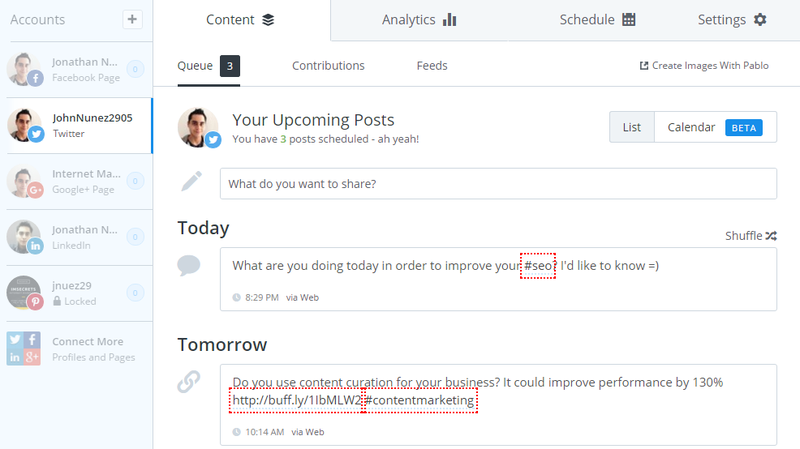 Buffer is a smart and easy way to schedule your content across social media. I love the layout of the app, it's very nice and clean. This is why most beginners are going to Buffer instead of Hootsuite, either way, it's fine both are awesome. The Pinterest connection is only available to ​the awesome and business plan. They have been doing great things with that integration, it's easy to use and will help you get more out of your Pinterest account. 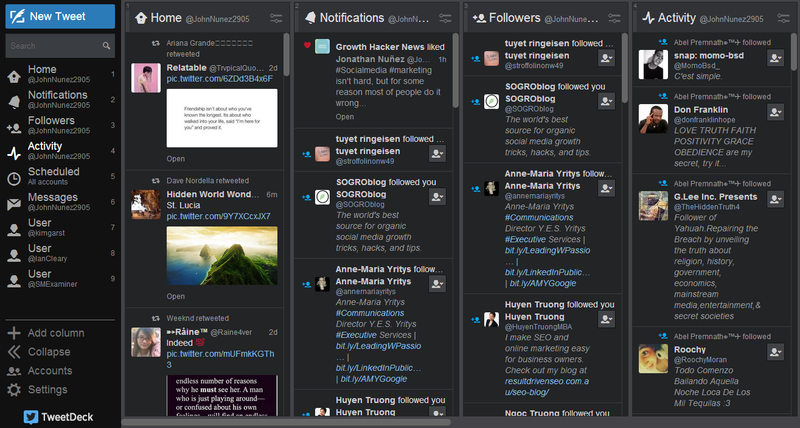 Tweetdeck is a web and desktop solution for your Twitter management, it is owned by Twitter and they are constantly updating their tool. It is quite easy to use and is very neat looking. As you can see in the image above, you have various streams for the proper management of your Twitter account. Notifications: Every time you get a new notification, it is shown in this stream (favorites, new followers, new messages). Followers: It shows your latest followers, this makes it easy to connect with them. Activity: It shows the activity of your followers. Scheduled: When you schedule a new tweet, it will be displayed in this section. Messages: New messages will be placed in this section (both what you send and the ones you receive). Monitoring: This is one of the best features of the tool, it allows you to monitor the latest tweets of a specific user or the use of a hashtag. IFTTT is one of the best management tools I've found and used, it can save you a ton of time every day depending on the amount of "recipes" you use. There are may different recipes you can create and on many ​social networks, blogs, bookmarking sites, etc. In the previous image, you can see what the iPad app looks like. As you can see, you can add a recipe for pretty much anything you may need. 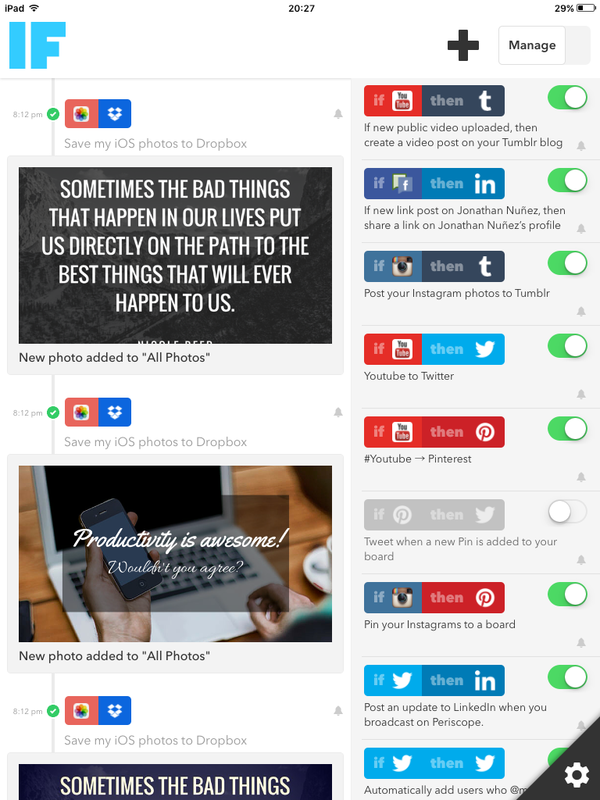 Klear is a management tool for Facebook, Twitter, and Instagram. This particular tool allows you to do social media listening, monitoring and get reports. You can also find and create relationships with the top influencers in your industry and build your community with the "Influencer Marketing Tool". Competitive analysis​ lets you track your landscape, see what's working for your social media profiles and develop your strategy. As you can see on the image above, you get an overall rating for your social media accounts, get demographics from them as well and they give you the interests of your audience, wich makes it easier for you to understand them. And as you can see in the superior right part of the image, they analyze your account and tell you what your expertise is. In my case, I'm an SEO expert. They are both incredible, however, in my opinion, Hootsuite is the best, this is due to the huge amount of apps they provide, wich helps you manage many platforms in a single dashboard and its capabilities to "listen". Here's a huge Hootsuite review I wrote to help you know more about their dashboard and help you make an informed desition as to whether Hootsuite is right for you or not. Have you tried any of the social media dashboards I mentioned above? If you have, I'd love to hear from you what your experience with them have been and which one do you like best! Nice post John, thanks for sharing. I’ve come to realize the last few months that I have not been doing enough with my social media accounts. Mostly because of time. So I’ve been putting alot more into it and tracking down tools that can help. One question, maybe you know, does Hootsuite have auto Twitter DM message for new followers? One thing I have not confirmed yet. Something I’ve also been using latley is Tweet Jukebox. Basically you have a loaded jukebox and it auto posts your tweets per the schedule you set, days, times, or all. What I really like is that it’s random. We know people use twitter at different times and I think they do not always get on exactly the same time, so random can catch more? Have not used it long enough to say it’s incredible, but my impressions did go up dramatically. And I was getting ALOT more likes, retweets and new followers. They have a free plan with up to 300 tweets. It use to unlimited per day. but I guess it was getting abused and now the free accounts only post 5 tweets per day. Sad, my impressions went down quickly. So i am going to get the next plan, paid. Well, you’ve probably already heard of it. I’m afraid Hootsuite does not have a DM option for twitter’s new followers, for that I use Crowdfire. It’s free to use and you can manage your Instagram account as well. 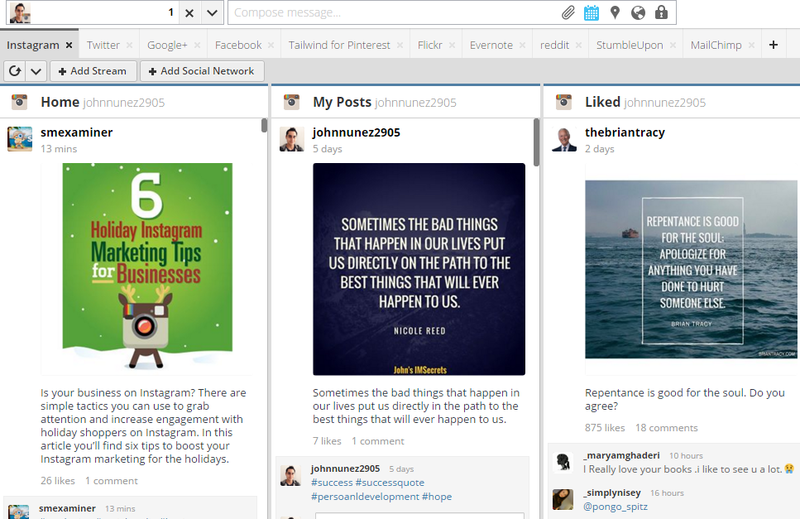 I’m a huge fan of Buffer myself, I’ve tried Hootsuite and it’s great but I like Buffer more for the design. Who knows, maybe at some point I’ll have to switch since Buffer is a bit limited on what it supports. I’ve never heard of Klear, but it sounds super interesting. Thanks for the recommendation!